Birthplace of the Mother Supreme Council. Courtesy of Scottish Rite Temple, Washington, D.C. In 1801, Abraham Alexander joined ten other men to found Charleston’s Supreme Council of Scottish Rite Masonry. Only two of the 11 “gentlemen” were American-born; four were Jewish. Masonry’s emphasis on brotherhood, charity, and mutual aid appealed to immigrants of all nationalities and religions, who were eager to demonstrate social solidarity in any way they could. 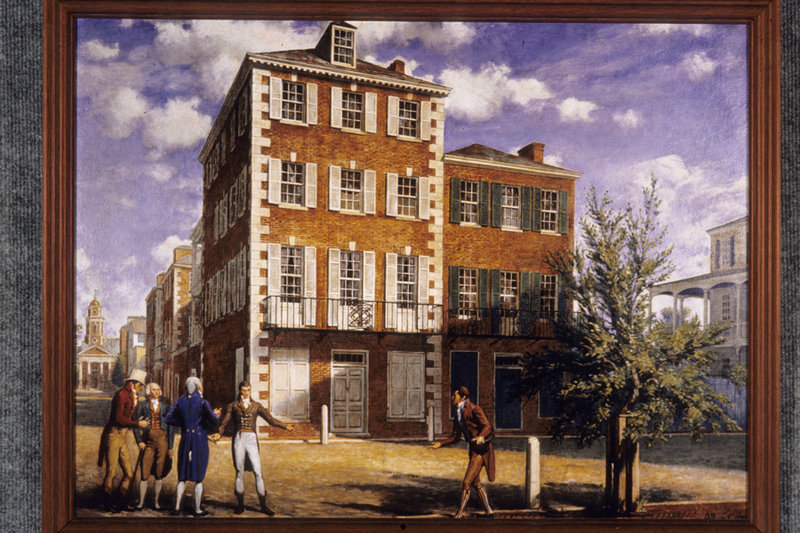 Five of the founders are depicted here at the corner of Church and Broad streets, where the Mother Supreme Council held its first meeting, on May 31, 1801. 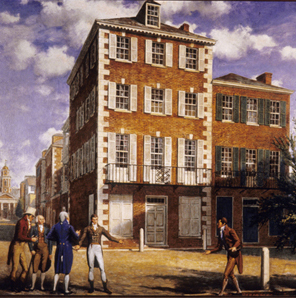 The building in the painting is misidentified as Shepheard’s Tavern (also known as City Tavern), which in fact burned down in June 1796 and was replaced by the four-story structure. A hatless Abraham Alexander stands second from the left.